Not many politicians will publicly make the case that the Department of Justice is being unduly tough on white-collar financial crimes, but the House of Representatives is set to vote Thursday on a bill that would meaningfully weaken the ability of federal investigators and prosecutors to go after certain cases of corporate malfeasance. The pleasant-sounding “Financial Institution Customer Protection Act,” written by Missouri Republican representative Blaine Luetkemeyer, would change the federal Financial Institutions Reform, Recovery, and Enforcement Act (FIRREA) statutes to remove investigatory power into crimes “affecting” federally insured financial institutions, and reserve it only for crimes “by” and “against” them. Banks or payment processors would no longer be held criminally responsible for simply aiding fraudulent activity involving customer accounts, since the fraud was not primarily conducted by the bank, nor against it. The federal government recently brought cases against CommerceWest Bank, Plaza Bank, and Four Oaks Bank & Trust for knowingly helping scammers withdraw funds from customer accounts, and if Luetkemeyer’s bill is passed, no similar cases could be brought by the government going forward. The push coincides with a Republican-led effort in the Senate that would also handicap the federal government’s ability to prosecute a wide variety of white-collar crime. The massive and bipartisan Senate criminal justice reform bill mainly focuses on reducing sentences for nonviolent drug offenders, but Republican senators are pushing an amendment that would increase the burden of proof for prosecuting corporate executives to “knowing” crimes, not just reckless or negligent ones. In an interview with The Nation, Senator Elizabeth Warren lambasted the two bills and accused Republicans of using the all-consuming presidential contests as a distraction. 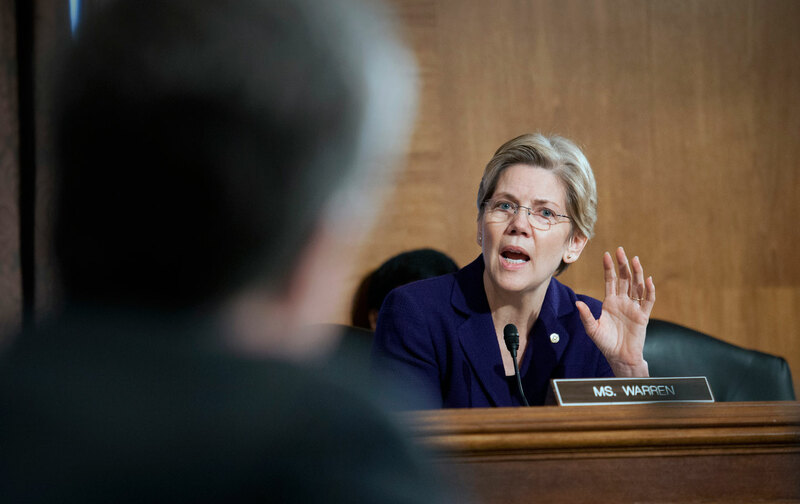 The interview was conducted not long after Warren gave a passionate speech on the Senate floor attacking efforts to hijack meaningful criminal justice reform to benefit corporate executives. Warren released a report last week detailing 20 cases where federal prosecutors caught big companies violating the law, but imposed only modest fines and did not require the offending corporations to admit guilt. Luetkemeyer’s bill is framed as preventing federal overreach, and deals with a federal initiative called Operation Choke Point that is controversial among many conservatives. In 2013, the Department of Justice began investigating banking activity by a wide variety of entities believed to be engaged in various types of fraud, from shady payday lenders to illegal gun dealers. In some cases, the federal government severed these entities’ access to federally insured banks. Some legal scholars made the case that Operation Choke Point violated the due process of these entities, but many conservatives sensed more ominous intentions. “Its true purpose was to kill businesses that the Obama administration and its liberal supporters simply didn’t like,” an op-ed in The Daily Caller charged. Dark fears aside, it’s the payday lending industry that appears most concerned about the legislation—CashNetUSA, Arrowhead Advance, and Cash America International all registered to lobby on the bill, as did the American Bankers Association and the US Chamber of Commerce. When Luetkemeyer—whose PAC contributions come overwhelmingly from the finance and real-estate sector—asked DoJ to conduct an inquiry into Operation Choke Point to see if the feds wrongfully terminated any banking relationships, the department found only well-supported cases of mass-market fraud. The House legislation is backed primarily by Republicans, but does have three Democratic co-sponsors, including Representative Patrick Murphy, who is running for Senate in Florida this year. Correction: This story initially said Self-Help Credit Union lobbied for the House legislation; it lobbied against it.